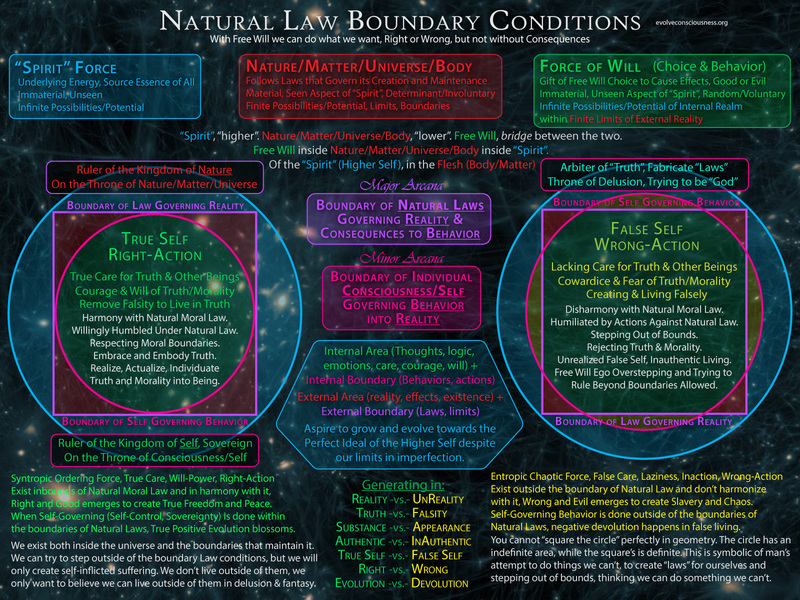 Natural Law Boundary Conditions for Living in the Way and Path of Truth and Morality. True Care, Will-Power & Courage to Live in Natural Moral Law. *Note – The video is not as good quality for the images. I recommend the audio + infographics, rather than video. “Spirit”, “higher”. Nature/Matter/Universe/Body, “lower”. Free Will, bridge between the two. Aspire to grow and evolve towards the Perfect Ideal of the Higher Self despite our limits in imperfection. Spirit is nonmaterial metaphysical potential. Matter is manifested potential into physical. Free Will Consciousness is Spirit/Consciousness metaphysical potential inhabiting the physical realm of Body/Matter. We can correspond our own internal domain (green) with being “spiritual” (blue) because it is a hidden immaterial nonphysical aspect. The “Spirit” itself is all of everything. The Natural Law Boundary Conditions are an aspect of “Spirit”. 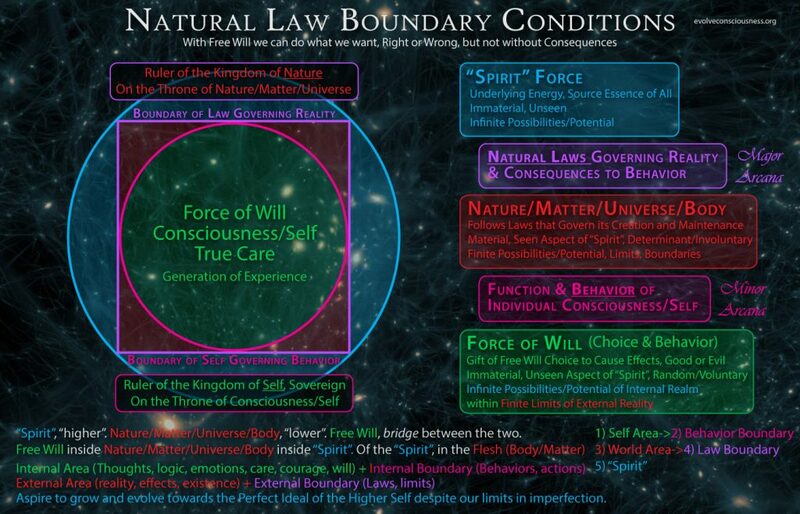 The Boundary of Natural Law (purple) is between the “Spirit” (blue) and the encapsulation of “Spirit” in Matter (red). Consciousness Self (green, 1st circle area) produce actions and behaviors (perimeter of circle). They go out into the World (red, square area). The Natural World is governed by Natural Laws (purple, perimeter of square) that set limits and boundaries. All is within “spirit” or unseen source (blue, 2nd circle). There is the Self Area of Consciousness that is encapsulated by our Boundary of Behavior and Actions which manifest into the Natural World. What we do Matters. That is the result. The Natural World contains all of Matter, including our bodies, and is encapsulated by the Boundary Conditions of Natural Laws. The Self Area and Boundary are metaphysical and physical respectively, and this is mirrored in the reverse ordering of physical and metaphysical in the World Area and Boundary, respectively. i.e. Physical is World Area (Matter in Reality) and Boundary in Self (Behavior of Body in Reality), and the Metaphysical is the Self Area (Consciousness Free Will) and Boundary in Law (Natural Law of Reality). The metaphysical components of Natural Law and Consciousness Self encapsulate the physical components of the Natural World and our Behavior into it. 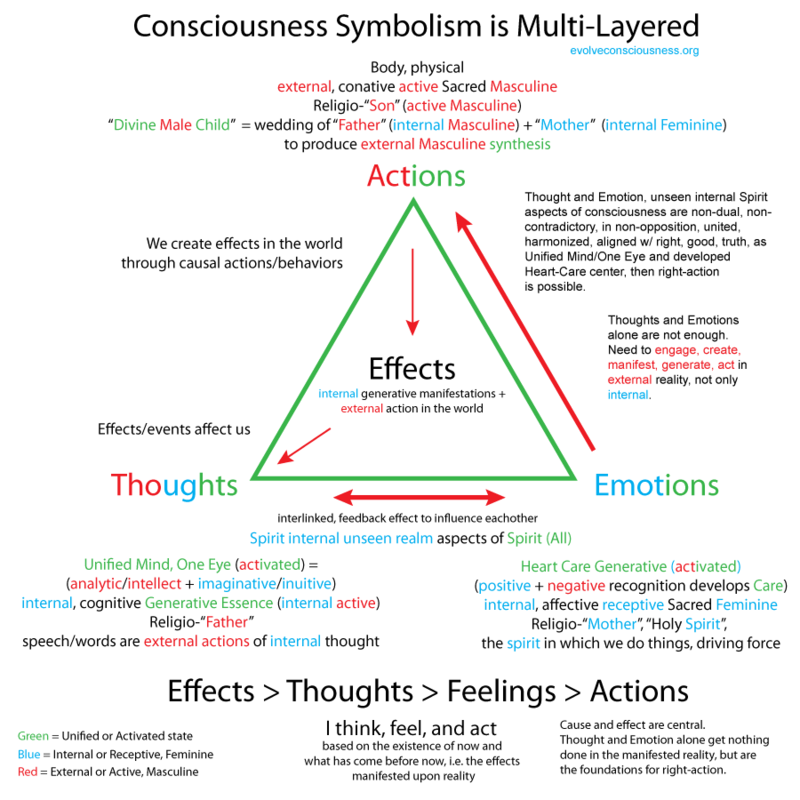 Since the Consciousness Self is the middle ground between Mater and Spirit, lower and higher, it could go in the middle in the diagram, but its in the front because that is where we are, and it is at the forefront of potential creation in the Matter, and it blossoms into True Care, at the center of it all. Consciousness is the individuated aspect of “Spirit”. In language, we have the phrase Freedom of Spirit. Freedom of Spirit, is the same as Freedom of Choice, which is the Force of Free Will. “Spirit” is infinite possibilities, which is partially contained in Free Will, and is converted into having possible choices from that internal spiritual domain, and creating it into the Natural world of Matter. The “Spirit” in which we do things, is from our Care and Will, the drive and motivation. The information is conveyed is the symbolic forms of shape and color. It turns out this represents the 4 Elements (Square, red), and the 5th Quintessence of Spirit that surrounds them all (Circle, blue). There are also the Three Essentials, Sulfur-Consciousness, Salt-Matter, Mercury-Spirit that I found out about after making this. The colors are explained more in depth in Spectrum of Life Opposite and Complement. I use light blue here for the similar contrast with all the other bright colors. The Spectrum infographic places the green in the middle visually, as opposed to in front and inside of Natural Law Boundaries of the Natural World to which we belong as shown here. It depends how you want to look at and describe something, then the visual representation changes as well. The Spectrum is using mostly color, and not using the much of the shape dimension of symbols to convey meaning, whereas the Natural Law Boundary image uses many shapes and colors combined. Instead of one view of the positive aspect of free will choice, this infographic has two aspects, the true self and the false self. This goes deeper. We exist inside the womb of Nature/Matter. We exist inside the womb of the body which is a part of Nature/Matter. They both exist inside the womb of “Spirit”, All, One, etc. The internal area/realm (green) is bounded and discerned from reality of the outside world (red) by our actions and behavior (pink). Stepping outside of the boundaries has us trying to step into being “God”, “Spirit” (blue), itself. We are not “God”. We do not dictate Truth or Natural Laws. We can discover them and follow them for our own maximum potential and benefit, and that of others. Imagine a balloon inside a box, and imagine it tries to expand. The more it does the more pressure builds up. Eventually it can’t expand more and the pressure is too much, it implodes from the counter-force of pressure that builds up acting against that artificial expansion. That is how Natural Law functions. Pressure exerted is stored at times. Reciprocation does not occur immediately until a buildup of exertion (over-stepping) against the Boundaries (box) is too much for the false living to contain it and the bubble pops, implodes, and the pressure of Natural Law violations (square) compresses the ego (circle) back down to humility in the universe, through a humiliation of actions that have consequences. The color of cyan for rulership of the false self is similar to the blue of the “Spirit” aspiration which we harmonize with as True Self. It is representing how one color, cyan, thinks it is being the “true self” in delusional mindsets. It is a false proxy substitute for the real thing, invoking the perception of being the real things as well. 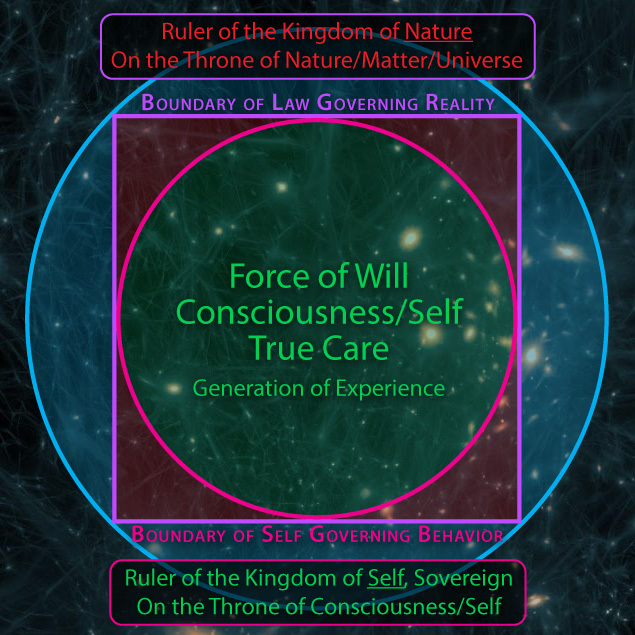 The Boundary of Consciousness/Self (green area) is shown through the culmination of the Trinity of Consciousness in our Behavior/Action (pink border). Previously in Consciousness-only inforgraphics, red was used to symbolize the Actions, but here it is Matter, and pink is for the Boundary of Right-Action output into reality instead. Right-Action respects the Boundaries of Natural Law, wrong-action does not, and tries to exist beyond the Boundaries of Natural Law. The reaping of the Willful violation of Natural Law Boundaries may be felt immediately depending on the severity of the violation and the degree of insulation from Bubbles of Reality, or pressure may be allowed to build up from the momentum and Force of Will exerted. But after some time, if the Force of Free Will that is over-stepping against the Boundaries is severe enough, it reaches an upper maximum point of resistance against the boundaries, and the false Bubble of Reality will implode under the pressure of Natural Law forces reciprocating. Natural Laws are the boundary conditions for our co-existence with other aspects of universe. They are in place for our own benefit and betterment. In False Self and Wrong-Action based living, the small green circle gets delusional and tries to expand beyond the limits that are for its own good. Eventually the resistance built up against the Force of Will falters under pressure and compresses, implodes, back down into the limits, but also with possible great impact and force of the elastic rebound from the maximum resistance being reached in the counter pressure between the balloon and box holding it in. The more we, as the circle area and boundary, fight against the Reality square area and boundary box of Natural Law, the more we will create counter-resistance in the pressure build-up and in the eventual reciprocation of the Force we have exerted against Natural Law Boundaries and Reality being sent back upon us. Imagine the Square as an elastic, and the Circle inside as something expanding. At a certain point the force of expansion of the bubble circle — violating the boundaries that hold it in check, exerting force against them — will not be able to out due the forces of the elastic resistance that will bounce back hard and fast once the upper maximum momentum is reached. The Boundary may “give” a bit, to certain points, with certain severities, with certain insulation, over time, but at some point, there is a reciprocal feedback reaping that bounces back on us to put us back within those boundaries we were breaking. It is a correction process for our own good, for our equilibrium and harmony in the system that we exist in. It is that simple once we understand it as a science, just as gravity or the weak or strong force. All Natural Laws are there for our creation, existence, sustenance and evolution in this reality construct. When we act in reality and affect it in ways conflicting with established Laws, we exert pressure against the boundaries of those Laws ruling Nature-Reality-Universe, and we will inevitably feel the reciprocal feedback to those Causes we Sowed. Our actions, in red in the Circle of Life infographic, are the last piece of the Trinity of Consciousness and sits atop the Throne of Consciousness in the Wisdom of Right-Action. Our Domain of Rule is that of our Consciousness which manifests ultimately, culminating in the end result, in the ability to Change the reality we live in through our Actions in that reality. Natural Law Rules the Domain of Reality and the Consequences to our Behavior. We rule ourselves and the behavior/actions we choose to engage in that either harmonize with or violate the Natural Laws. In True Care, the Care for Truth and Morality, we can be our True Self more and more, and always living to do what is right, good and true, in the Way and Path. This is the other Rulership of the Kingdom of Self. There is Unity Consciousness of the three expressions of consciousness, Self-Rulership, Self-Control, Self-Governance, etc., and we can Rule the Throne of Consciousness in living in Right-Action. That is the Throne we can Rule. True Self in Unity of the Trinity of Consciousness that culminates into the Wisdom of Right-Action at the top of the Trinity. That is the Kindgom we Rule. True Self, Right-Action in Free Will Choice through Unity Consciousness. It is at the front of the infographic here. It is at the top of the Spectrum of Living infographic. It is at the top of the Unity Consciousness Trinity (Action). That is our Kingdom of Rule, where we govern into reality, self-govern, within the Boundaries of the Kingdom of Rule of Natural Law which is governing the Natural World, reality. The False Self is in Wrong-Action or Inaction and its boundaries of behavior are breaching Natural boundaries. As a sovereign, self-ruled, self-controlled, self-governed individual, you know where your boundaries are by knowing the boundaries of Natural Law. That is why the Actions & Behavior are the Boundary for Self, in pink. The Wisdom of Right-Action is the alignment and harmony with Natural Law limits of Right and Wrong. A Trinity of Consciousness Unity is not enough. Dark Care or Ignorant Care can have people who are Unified in Consciousness between their thoughts, emotions and actions. This is not the True Self. The True Self is getting to aspects of the Higher Self, Higher Will of Natural Moral Law and living in harmony with it, making that Way and Path a part of your way of living all the time. – Natural Law processes like a computer program, with boundary conditions and limits. – The Law functions like a computer program with boundaries and limits that are preset in the design of the system that the Law operates within. – Humans are more unique than the Universe , we are gifted with Free Will choice to decide what actions we take. The Universe isn’t able to choose, it doesn’t have this gift, it only follows Laws, unwaveringly. – Universe and Laws do not take peripheral factors into consideration. Cause and Effect. Something is done, something happens. – Humans search for justifications for continuing evil, like my job to pay the bills for my family to survive, I need to keep doing what I do, its ok, I’m a “good” person no matter what. The universe does not search for all these intents of context surrounding your decision. It does not care about the peripheral factors of your life. It only cares what you choose to do. Period. – The ORDERING FORCE is Free Will. The state you will get when if you let everything happen is entropy. Entropy is the progressive force, how things tend to go, into their most undifferentiated state. If you do nothing you get chaos. WILL is the SYNTROPIC FORCE that counters the entropic force. It is the ordering principle. If you don’t use will, nothing gets changed. If you stay passive, nothing gets changed. Expect more of the same. Will power and courage will lead to change.